Also known as ´Cordova´ in English, it is a city in the southern Spanish region of Andalucia, and the capital of the province of Córdoba. ´Cordobense´ is the name given to the cities´ 330,000 inhabitants. The first trace of human presence in the area are remains of a Neanderthal Man, dating to c. 42,000 to 35,000 BC. Prehistorically, it has been found out that the first trace of human life in Córdoba, belong to the remains of a neanderthal man dating back from 42,000 to 35,000 BC. Historically, Córdoba was first conquered by the Romans in late 3 BC. At the time of Julius Caesar´s sovereignty, Córdoba was in fact the capital of the Roman province of Hispania Ulterior Baetica. The city itself sits on the banks of the Guadalquivir river and has easy access to the mining resources of the Sierra Morena (coal, lead, zinc), which supplied a great deal of help to the Roman Empire. Cordoba is most well-known for its Islamic architecture with its pure jewel The Great Mosque. It was conquered by Muslim armies in the 8th Century. It then went on to become the capital of the Islamic Emirate in Al-Andalus and then Caliphate of Córdoba. However, unlike other towns on the Iberian peninsula, no capitulation was signed and the position was taken by storm. Consequently, Córdoba was governed under direct Moorish rule. In 716 it became a provincial capital, secondary to the caliphate of Damascus. Throughout the caliphate apogee it is recorded that Córdoba had a population of almost 500,000 – 1,000,000 inhabitants. And later on during the 10th and 11th centuries, Córdoba was one of the most progressive municipalities in the world, combined with being a great cultural, political, financial and economic centre. Then came the Spanish Reconquista, which is the period between the Islamic conquest of Hispania in 710 through to the invasion from the Christian Kingdoms in 1492. The reconquista transpired throughout the Iberian Peninsula and saw the rise and fall of several almighty kingdoms. During this time, Córdoba was seized by King Ferdinand lll of Castille in 1236. However, the origin of the reconquista is reported by historians to have taken place in circa 718-722 BC. It began with the battle of Covadonga. During this battle a modest sized Christian army was governed by Pelagius (a nobleman nonetheless). He defeated the Caliphate’s army in combat, up in the mountains of Northern Iberia. This in turn saw the first victory of Christian military forces in Iberia since the Islamic conquest by the Umayyad Caliphate; and subsequently led to the creation of the independent Christian Kingdom of Asturias. Despite this however, there was something much greater on the horizon on the other side of the world, in the form of the ´New World´. The new world being the European re-discovery of the Americas which yielded the arrival of the Portuguese and Spanish colonial empires. The city declined after renaissance times and the population was reduced to a mere 20,000 inhabitants. It wasn’t until the early 20th century that the population and economy of Córdoba began to see an increase. Córdoba has a vast amount of history and phenomenal sights to see. It has the most extensive historical heritages in the world declared on the World Heritage Site by UNESCO (on 17 December 1984). The total area of Historic Centre of Córdoba encompasses 80.28 ha. The 8th century was a significant period of time for Córdoba as it produced some of the greatest architectural pieces of its time. Approximately 300 mosques, countless palaces and multiple public buildings were constructed. The idea behind these great masterpieces was to rival the grandeurs of Constantinople, Damascus and Baghdad. Cordoba’s period of greatest glory began in the 8th century after the Moorish conquest and by the 10th and 11th centuries, Córdoba was one of the most advanced cities in the world as well as a great cultural, political, financial and economic centre. The Historic Centre of Córdoba spans the streets encompassing the Great Mosque and the houses situated around the Mosque and the surrounding areas. These areas extend to the South bank of the River Guadalquivir (including the Roman bridge and the Calahorra); the Calle San Fernando in the East, the commercial centre in the North and even incorporating the AIcázar de los Reyes Cristianos and the San Basilio quarter in the west. The scenery in Córdoba’s Historic Centre emulates thousands of years of occupation by different cultural groups i.e. Roman, Visigoth, Islamic, Jewish and Christian in its mixture of architecture. The area is a true reflection of the urban and architectural complexity reached during the Roman era and the splendour of the great Islamic city, which, between the 8th and the 10th centuries, represented the main urban and cultural focus in the western world. Even today there are still many ancestral homes and traditional houses. The communal houses built around interior courtyards (casa-patio) are the best example of Cordoban houses. They are of Roman origin with an Andalusian touch. The most popular sights in the Historic Centre are The Great Mosque of Córdoba, The Roman Bridge, The Calahorra Tower and the Jewish Quarter. 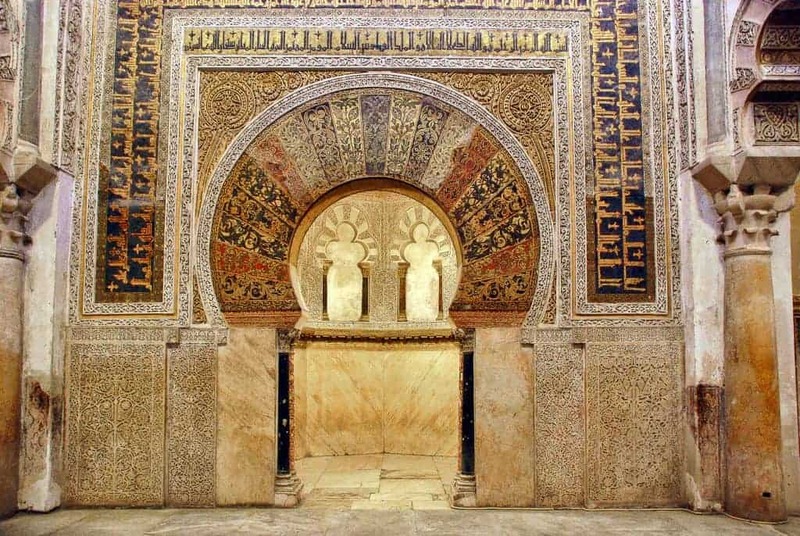 The Great Mosque of Córdoba is a representation of incomparable artistic achievement. Its size amalgamated with the towering height of its ceilings makes it truly majestic. Although none of the pillars used to build the Mosque were the same height, (and thus presenting a technical challenge to its architects); It is a testimony of the Caliphate of Córdoba and is one of the most symbolic monuments of Islamic architecture. After the Holy Mosque in Mecca, it was the second biggest mosque in surface area and had an unusual style of design, which demonstrates the presence of Islam in the West. In the 13th Century, under the reign of King Ferdinand lll, Córdoba’s Great Mosque was turned into a Cathedral. Córdoba has the most extensive historical heritages in the world declared World Heritage Site by UNESCO (on 17 December 1984). The total area of Historic Centre of Córdoba encompasses 80.28 ha. Built in the early 1st century BC, The Roman Bridge (Puente Romano) sits over the Guadalquivir River and links the area of Campo de la Verdad with Barrio de la Catedral. Constructed by the Romans, it is believed to have been built over a previously wooden bridge. Until the construction of the San Rafael Bridge in the mid 20th century, the Roman Bridge was the city’s only bridge for 20 centuries. It is also most likely that the Via Augusta (a Roman road crossing all of Hispania province) passed through it. Roman Bridge was the only bridge of the city for twenty centuries, until the construction of the San Rafael Bridge in the mid-20th century. The bridge is held up by 16 arches one less than when it was originally built and it is an astounding 247 metres long, with a width of 9 metres. None of the arches are original and the bridge has been renovated several times.During the early Islamic rule of Andalucia, the Muslim governor Al-Samh ibn Malik al-Khawlani decreed that a bridge be built on top of what remained of the Roman ruins. The arches itself are a depiction of famous Moorish architecture which covers much of the city’s scenery. Following this, in the Middle Ages the Calahorra Tower and the Puerta del Puente were built at the bridge’s southern and northern ends therefore making them 16th century reconstructions. Later, in the 17th century, an effigy of St. Raphael, sculpted by Bernabé Gómez del Rio was placed in the middle of the bridge. In modern culture, The Roman Bridge was featured in season 5 of the popular fantasy television series, Game of Thrones. It is not the first time that Spain has been used for the mise en scene.The series is set in a fantastical land of Seven Kingdoms, making Spain’s extensive list of historic architecture, a most favoured shooting spot. The Calahorra Tower(Torre de Calahorra) is a protected gate which stands in the Historic Centre of Cordoba. Built by the Moors (Almohads) in the 12th Century it is a great piece of Islamic architecture. The tower itself rises up at the South of The Roman Bridge, the opposite end of the city centre. In 1369, the tower was extensively restored by King Enrique ll of Castile. He used it as a safeguard to defend the city from attack by his brother Pedro l the cruel from the South. Originally, the foundation was an arched gate between two towers, Enrique ll later added a third cylindrical shaped tower connecting the two. The tower was still used in later times, in the 18th century it was used as a prison, and in the 19th century it was used as a school for girls. In 1931 it was declared a national monument, and the restoration of the tower alongside The Roman Bridge was awarded the EU prize for cultural heritage (Europa Nostra) in 2014. Currently, the tower is home to the Museo Vivo de Al-Andaluz. The museum is extremely fascinating as it shows audio-visual presentations of life in Cordoba around 10 AD, when three cultures lived side by side, Christianity, Islam and Judaism. Inside the museum there is also a scale model of the Great Mosque of Córdoba in its original form during the Moorish times, before it was transformed into a Cathedral. Additionally, visitors are allowed on the rooftop to see a spectacular view of the whole city. The Jewish Quarter is recognised as the second most well-known part of Cordoba’s historic centre, which was declared a World Heritage Site by UNESCO in 1984. The Judería de Córdoba is a representation of how the city was once a splendid period when three religions coexisted side by side and lived peacefully. The Jewish quarter is home to many historic sites which include, the synagogue, maimonides statue and Casa Sefard. In the heart of the quarter lies the Synagogue in Calle de los Judios. A Mudéjar construction dating from 1315, it is one of only three original synagogues remaining in Spain. In the 16th century, it was converted into a church and later held the Guild of Shoemakers until its rediscovery in the 19th Century. The interior includes a gallery for women and plaster work with inscriptions from Hebrew psalms and others with plant motifs on the upper part. Its focal point is a beautifully restored wall which has a semi-circular arch. This is where the Holy Scrolls of Law used to be kept. The Sephardic House (Casa Sefard) in the Jewish Quarter is a relic which has been restored to how it would have been in the 14th century, before the Spanish Jews (known as Sephardi) were expelled from Spain by the Catholic Kings.